All of our classes meet from 9am-1pm each day. You can choose the number of days you want to attend (2,3,4 or 5) based on class availability at the time of registration. 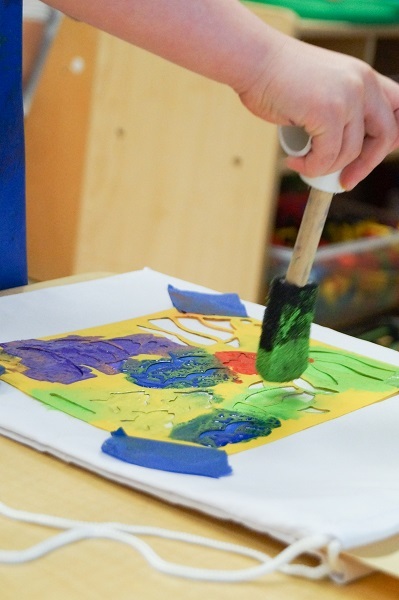 We offer a developmentally appropriate play-based learning environment for young children ages 1-4. Developmentally appropriate practice means that we understand how children develop and learn and how that fits into effective early childhood education. Play-based learning is an early childhood environment that encourages children to freely make choices, engage in activities, explore their environment, and interact with other children. The teacher's role is to plan activities and experiences to attract children and engage them, based on their knowledge of the child and the child's interest. Here at Good Shepherd we plan for your child's day to be engaging, interactive, and fun! The teachers understand your child's individual development and interests and seek to meet their needs throughout the day. Children engaged at the sensory table with various mixtures (sand, water, oatmeal, dried beans, etc.) are developing their sensory awareness and fine motor skills as they scoop, pour, touch, and pick-up. These fine motor skills are the same skills needed for writing as they grow older. Children engaged in the block center with building blocks of various kinds are developing their sense of height, width, balance, etc. These are the precursors to math and science skills that will later become geometry and physics. Children engaged in a cooking activity are developing their sense of order, measuring, following directions, etc. These are the beginnings of math, science, and reading skills that will become critical to later learning. Children engaged in the dramatic play area are developing their sense of imagination, story, social skills, etc. This imaginative play is building cognitive skills as well as social/emotional awareness that every child needs in life. Children exploring how to write letters in a sand tray, build letters with popsicle sticks, find letters on a scavenger hunt in the classroom, identify their friend's name, or identifying environmental print (McDonalds, Harris Teeter, etc.) are building pre-literacy skills that will lead to reading and writing superstars. No worksheets needed!! Process art focuses on the process of doing the art, not the finished product. No two children's work will look the same. There are no preconceived notions about what a child will make. It is completely a child's own work. Young children love to explore and create. Process art allows them to use the materials that we provide and create whatever they want to with the provided materials. We do not provide models or directions to follow, beyond how to use materials like scissors, glue, etc. There is lots of painting, stamping, mess-making, and more. Children are allowed multiple opportunities and unlimited time to create their masterpiece. Art develops all domains of development...cognitive (processing, creativity, much more), fine motor (painting, tearing, cutting, etc. ), social/emotional (feelings can be displayed in art and it's way more fun to do art with a friend), and language (children talk about their art and we often add dictation to describe their picture). So what do we do with these endless pieces of artwork? We will offer the child the choice to bring home their work or throw it away. It's amazing how children make this choice! They truly know what they want and which pieces they find special. It's their work and they deserve a choice. You can do the same thing at home when it comes time to clean out the collected work. How can you respond when they run to show you their work and you see "nothing?" Make comments like...wow! You worked hard! You used lots of colors! You are an artist! Ask questions like...What did you use to make your art? How did you do it? These type questions focus on the process of making it rather than the finished product. We use Creative Curriculum as our basis for our classroom environments and lesson planning. This curriculum supports developmentally appropriate learning, but still allows for teacher creativity in planning. Many times, themes for planning are chosen based on children's interests expressed in the classroom. Do we integrate the Bible and religious teaching into our program? We are a ministry of Good Shepherd Presbyterian Church and we do integrate Biblical themes where they are appropriate and make sense to the children. The children attend Chapel Time once a week with Pastor Robert and Ms. Melissa. There they sing songs, hear a Bible story and pray together. The children learn blessings that they say before lunch. Beyond that, the teachers are encouraged to include Bible themes and stories into their plans where they make sense. For example, in a unit about construction they may integrate the story of Noah's Ark. Our teachers are always living their day with the children as an example of God's love for them.